Once an application is received and made valid the Ordnance Survey (O/S), location plan, with the site outlined in red, is entered into the Aberdeenshire Council computer and a program then generates a 20 mtr. circle around the RedLine Area of the development site. Aberdeenshire Council then send Neighbour Notification letters to all address points shown on their system within 20 mtrs. of the site. Aberdeenshire Council do not have land ownership records therefore they can only identify neighbours by the O/S base map and address points on their computer system. All applications are also advertised in the local Newspaper apart from Householder Applications which are no longer required to be advertised in the local press. The boundary of the land for which development is proposed is determined in the circumstances of the case, but need not be a property boundary. For example, in the case of farms or estates where a building is being erected in one part of the farm or estate, it is not the whole farm or estate that is being developed so it would not make sense to use the boundary of the farm or estate as the boundary of the land for which development is proposed. In the case of a specific site for the purposes of a supermarket, industrial or business premises, for example, then the boundary of that specific site will normally be the boundary of the land for which development is proposed. With most private houses in urban areas, for example, it will probably be the property boundary. In practice the boundary of the land to be developed will normally be indicated by a red line on the application location plans. 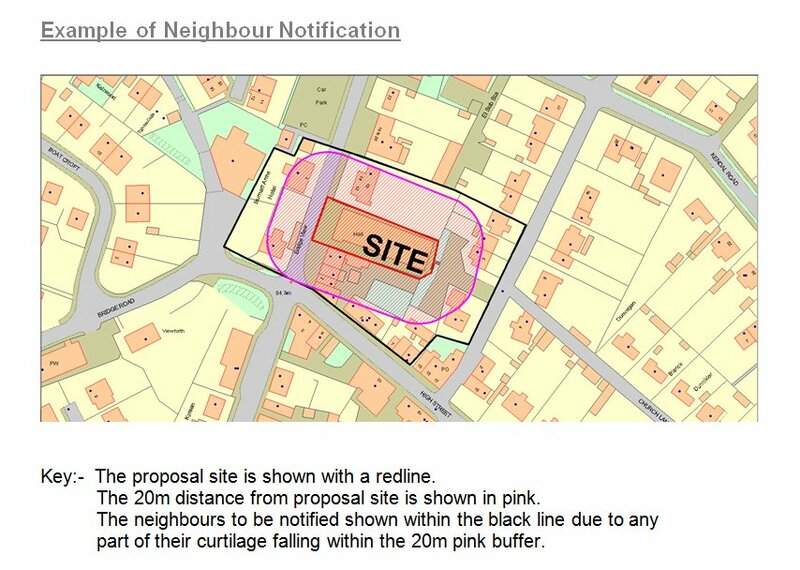 The premises on neighbouring land to which neighbour notification should be sent do not have to be within 20 metres of the boundary of the land for which development is proposed. Such premises can be elsewhere on the neighbouring land. In using the term “area or plot”, the aim is to identify this as a discrete piece of land. Where such neighbouring land consists of open fields, countryside or woodland with no obvious premises on it, then an advert would be necessary. Planning authorities should carry out neighbour notification as soon as possible after the application has been validated. This is to ensure that, given the minimum period of 21 days within which individuals can make representations, the planning authority can determine applications with the minimum of delay. A single notice must be sent to the “Owner, Lessee or Occupier” at the address of the neighbouring land. Under regulation 18(2)(b), where there are no premises on the neighbouring land to which the notification can be sent, the planning authority must place a notice in a local newspaper in accordance with regulation 20 (see paragraphs 4.23 to 4.29 below). Regulation 20 includes certain exceptions to the requirement for newspaper notices in such circumstances. Relevant planning authorities are also required to give notice of applications to the Cairngorm National Park Authority within 5 days of the validation date where the proposed development is in the area of the Park Authority. in relation to applications which require PAC, a statement that despite the fact that comments may have been made to the applicant prior to the application being made, persons wishing to make representations in respect of the application should do so to the planning authority in the manner indicated in the notice. On the last point, the requirement in regulation 18(3)(j) is to make clear that comments made to developers in the pre-application stage are not representations to the planning authority.